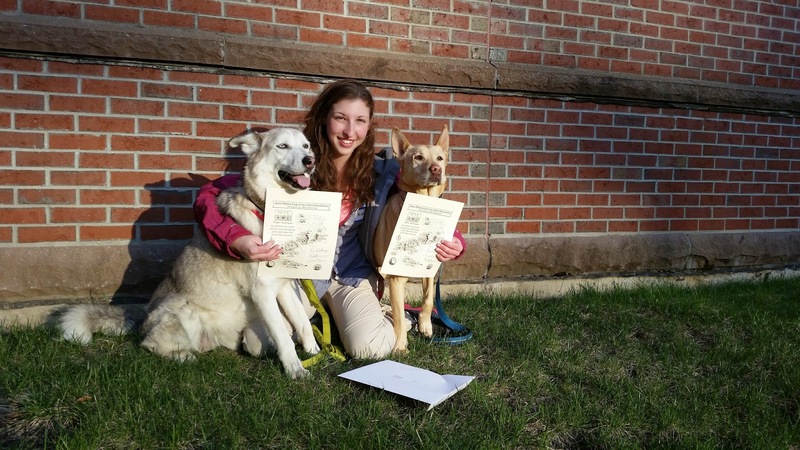 Saturday, Linda, Tybtangs, and I did a loop around Frankenstein Cliffs and Arethusa Falls then headed south to the Four Thousand Footer awards ceremony in Stratham where Tybtangs and I received our scrolls. Sunday we trekked to the base of Tuckerman’s Ravine to watch the skiers. The weekend reminded me of how special being out there with the dogs and bipedal loved ones is, how far we’ve come, and how completing “the list” was more of a starting point than a finish line. This hike is a really neat half-day experience with unique features and a nice variety of terrain. We opted to go counterclockwise to avoid having to descend the steepest section in questionable spring conditions. We parked at the lower lot where Ty had some of the craziest zoomies I’d ever seen from her. Shortly after beginning, the trail crosses a trickle of water (really, I know minimal hiking terminology, I just put one foot in front of the other in the direction the dogs are going!) At that point we managed to find ourselves walking the tracks instead of following the trail (which runs parallel). At the trestle, there is a well-trodden path back to the trail. We passed the point where it picks back up with the trail to check out the trestle, only finding the “keep away from trestle” sign on the ground up the hill afterwards…. The trail quickly becomes moderate in grade then quite steep as you look up at staggering views of the cliff walls and melting ice. With a fine layer of fresh, wet snow underfoot, we were happy with our decision to go counterclockwise! After veering away from the rock faces, the grade drops down to a gentle incline. We reached an unmarked junction, had a gut feeling to go left, and explored to the right instead. Then we lost that trail and ended up bushwhacking…. Being not far from the car, having many landmarks, and under good weather and trail conditions, we figured this was as good a day as any to get a little lost and have to right ourselves. We ascended off trail for a bit, moving closer to what I thought might be the base of Falcon Cliff. I looked ahead and the dogs had made a 270 degree turn and were waiting for me to make eye contact with an expression that made me tell Linda I was abandoning our attempt to wander. Five minutes later, we were back on the correct trail and headed towards the cliffs. The trail ascends into eerily beautiful conifer woods - skinny limbs covered in moss and lichen rising from a ground cover of fallen trees. It opens up quickly onto the outlook where we took a ton of photos. From there, the trail continues on, gently ascending to a junction where one can do a spur to Falcon Cliff (we skipped it) then another outlook that was socked in when we passed. After that, the trail begins descending. As with the ascent, it varies smoothly between sections of flat and gently changing elevation. The tree cover also changes and after a water crossing close to the junction for Arethusa Falls, the trail follows the river and I’ll tell you, after such a long winter, there’s not a sound in the world that sounds better than rushing water! The trail to the falls, while very well maintained, is incredibly slick right now due to the high volume of traffic. Very few of the people and families we saw were prepared in any way. It’s still winter in the north folks! Jeans and sneakers will not cut it…. The falls themselves are really cool to see and make me pine for summer and swimming season. We stuck to the Arethusa Falls Trail to get back to the car and were treated with some stretches of DRY DIRT trails! Bye Frosty, see you next winter! Next on the agenda was the AMC’s Four Thousand Footer Award Ceremony. I’ll breeze through this, as it is mostly for my own benefit, but I will say that if you are working on any of the lists recognized by the AMC and are on the fence about attending the meeting, I strongly suggest you consider going. The Board spends a great deal of time and heart acknowledging the accomplishment. The authors of It’s Not About the Hike presented a slideshow of photos submitted by this year’s inductees (Ty, Tango, and I included) that had tears welling up in my eyes. Linda was with me and I absolutely freaked out when they included a photo of us, the dogs, and our friends Liz and Shawn sitting atop the rock pile on Hale. 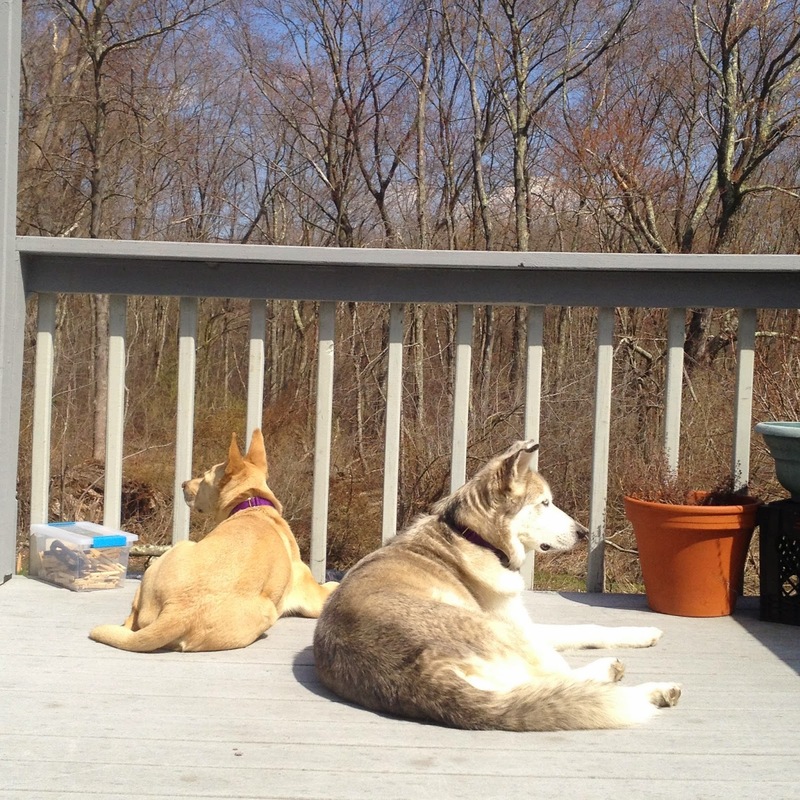 It also made me want to run outside to the dogs because we did this 100% together. It was a chance to meet some of the folks I knew only through the hiking groups online too. A hike and hiking ceremony in one day was both incredible and exhausting and I was asleep soon after our return home. Ah but the weekend was not over! Our original plan was to hike to the bottom of the bowl to watch the skiers and boarders and were watching all the weather and avalanche pages closely. We hemmed and hawed, skipped the turn for 16, went down to the junction with Conway then took a hard right back onto 16 towards North Conway and up to Pinkham’s. Best decision of the weekend! Our beautiful, awesome on-again, off-again hiking buddy! adopting a new human pack! 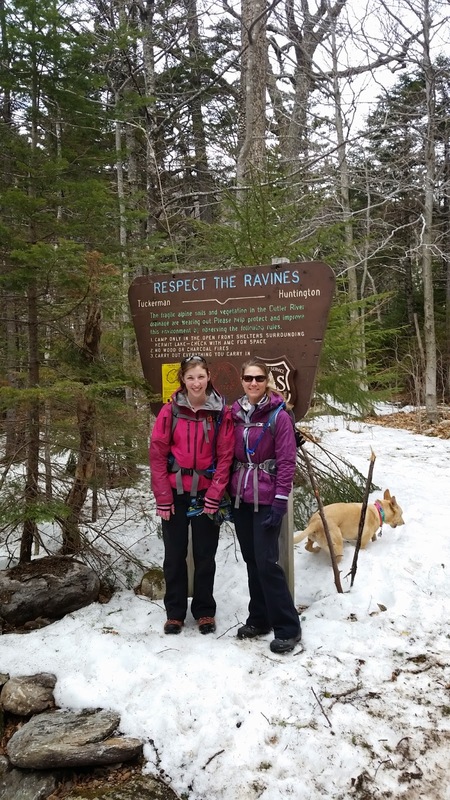 The Tuckerman’s Ravine Trail begins at the Pinkham Notch Visitor Center. I love the current conditions. 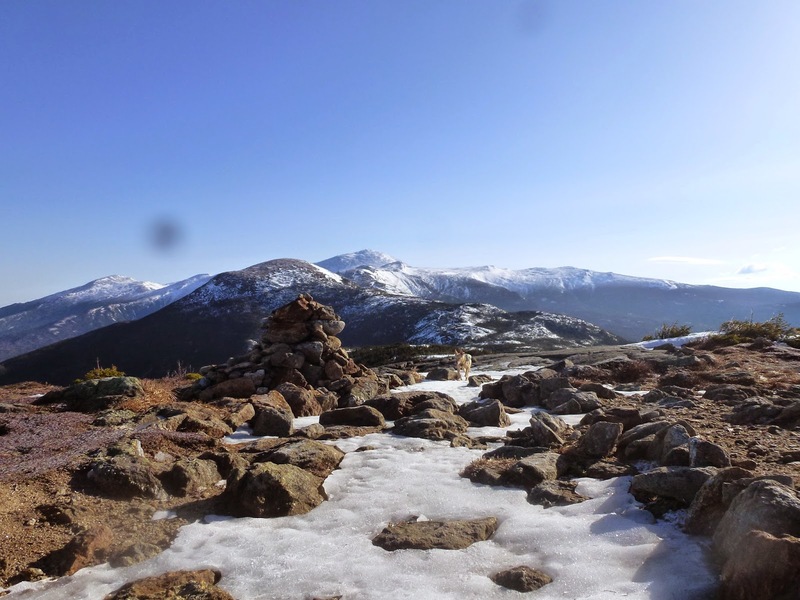 It is such a well-traveled trail and free of postholes, that it is mud and soft but easy to walk on snow below (bare boots or micros will do) and hard packed (but slushy as the day warms) above. The trail is wondrously wide. We passed and were passed by many others but it never felt crowded, unlike most of the one-lane trails in the Whites. If you have read other descriptions of the Tuck’s trail, they’re all right – a steady but relentless grade. There are no steep sections but also few sections where it levels out. It is only 2 miles and change to the shelter though and goes pretty quickly. The Hermit Lake Shelter was buzzing and there was a Ranger advising skiers and boarders about conditions. Cool stuff! This was a totally different kind of hiking experience and something Linda and I agreed we most definitely want to do again. At the shelter, we changed gear before heading to the base of the bowl. It is very steep at first, making me question if I’d led us onto the right trail. It is stunning though, trees frosted with fresh snow, rocks strewn everywhere, everything that puts us in awe but also makes us excited for summer hiking! 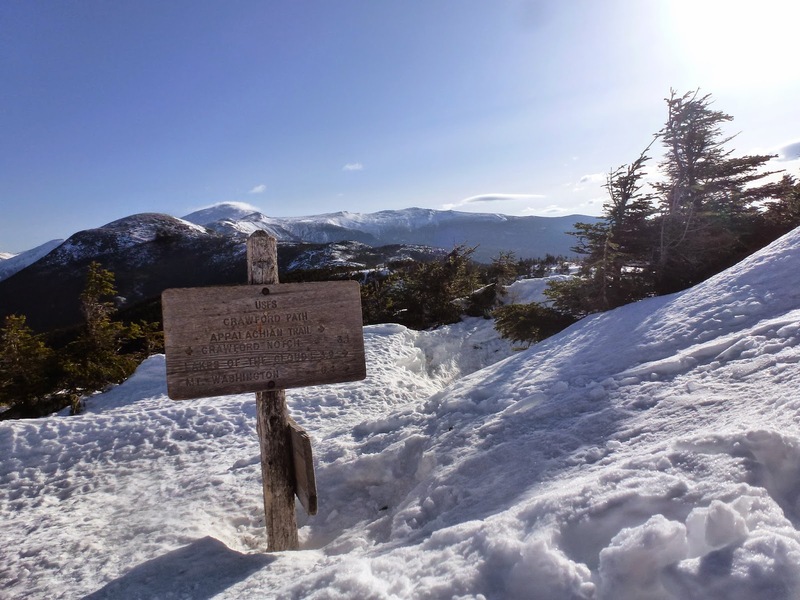 Then, there it was: Tuckerman’s Ravine. Even in the thick fog, we could see the top of the headwall looming above. I have never been anywhere like it. The base is broad and people were gathered in small groups discussing different approaches. The trek up looks grueling and we did not get to see many folks reach the top of the runs and head down while we were there (many were on their way up when we decided to turn back) but it was so fun. This was also a particularly dog-friendly day which was awesome! We booked it back, enjoying the sun that decided to come out and the perfect grade for sliding on our heels. We checked out the very hospitable visitor center then headed home. 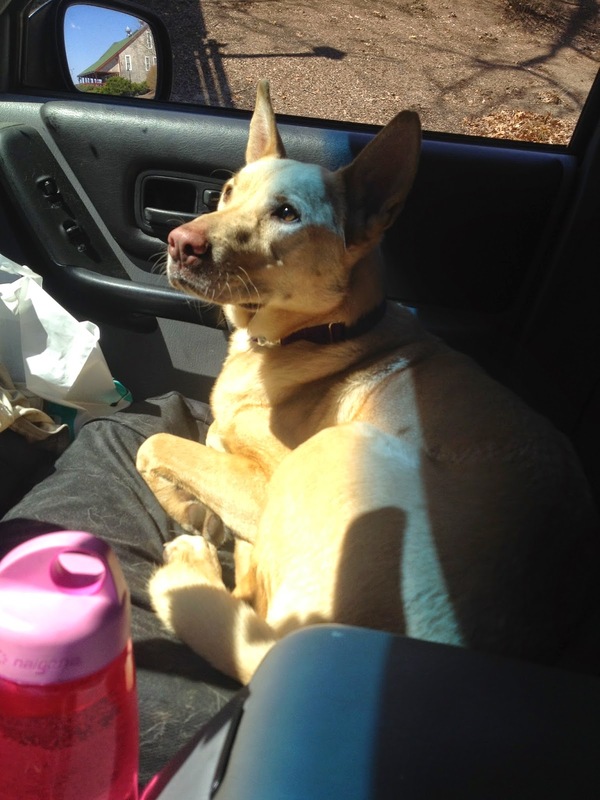 Thank you, thank you to those still reading and, as is always my goal, I hope this tale was helpful in somebody’s research in deciding where to hit the trail with their pup! Arethusa Falls is an excellent starter or mellow hike with enough challenge to decide if a bigger hike is your or your dog’s cup of tea but keeps avid hikers equally entertained. The blessing and curse of Tuck’s is the moderate but incessant drive up to the cabin. I leave that to readers to decide of that is in line with their style. Overall it worked well for us, not as many natural break points for Tango but not as much need for stops either. 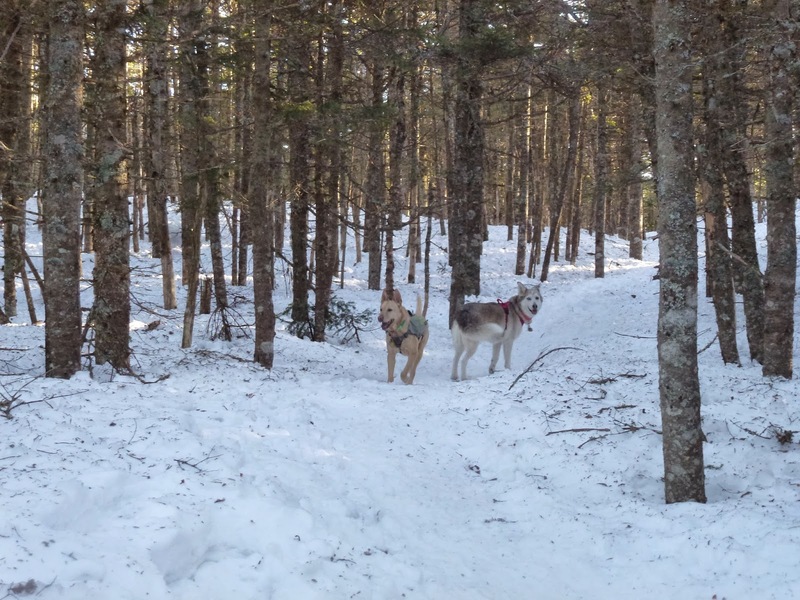 It is one of the more popular hikes we’ve done in awhile, which Tango loved and allowed for a good deal of practice with our manners and socialization. We also made great progress in developing a routine that will allow Tango to continue to hike with enthusiasm. A brief warm-up walk/stretch, carefully timed low-dose aspirin, and a post-hike massage, focusing on the muscles favored while hiking made for a very happy boy two days in a row and that puts happy tears in my eyes! 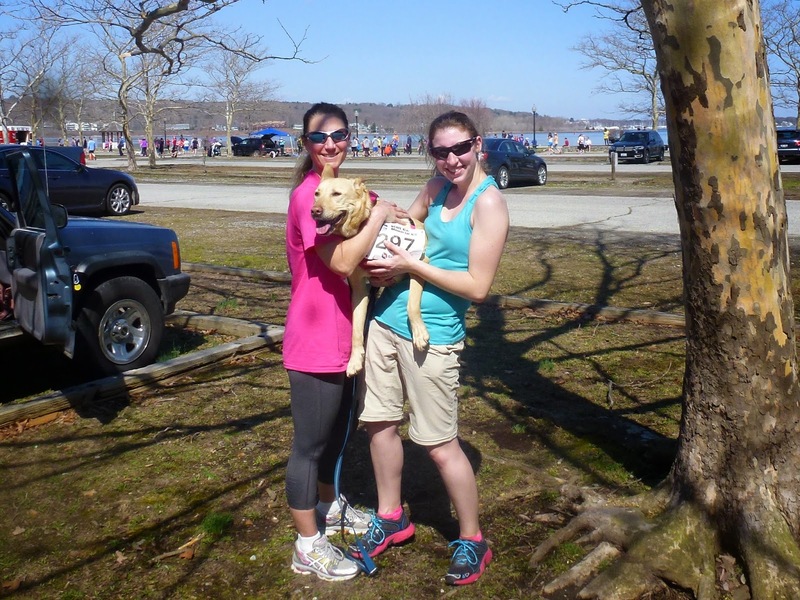 The weekend of Patriot’s Day was a full one spent with loved ones from Maine to Rhode Island so I thought I’d share some of our adventures in case anyone has travel plans this summer and needs ideas for dog-friendly pit stops! 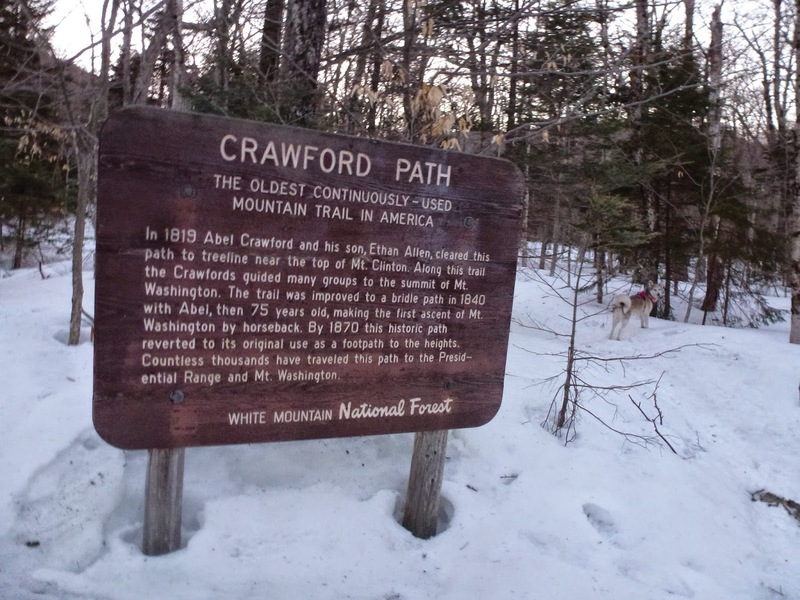 All the places listed below have broad appeal to those with families, close to the highway for a quick travel break, potential for a longer walk/jog/snowshoe/horse ride/picnic with family, or to steal some solitude between visits. Goddard State Park, East Greenwich, RI. Less than 10 minutes from Rt 95 and downtown East Greenwich (which has lots of shops, outdoor cafes, and a dog bakery). 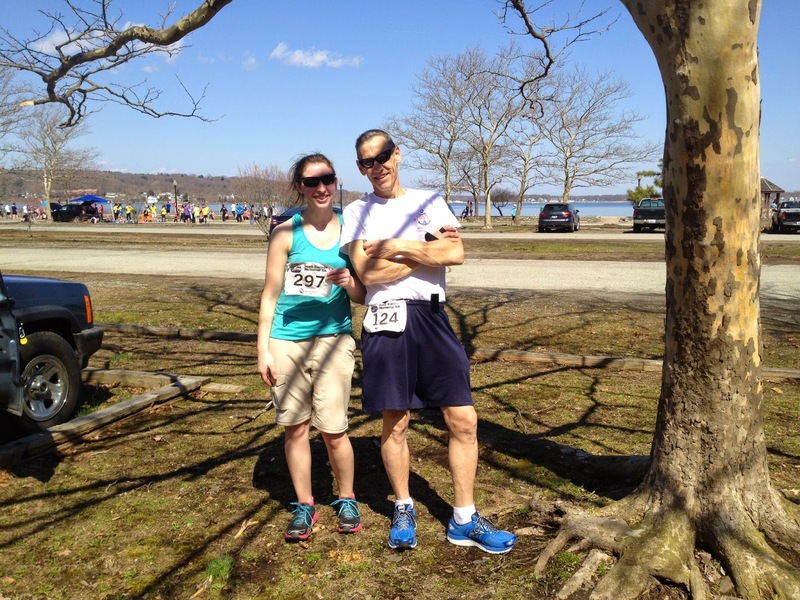 Saturday, Ty and I completed our first 5K road race together. It was a dream experience where all the little details and preparations came together for a great day. Our “warm up” was meeting my aunt and uncle with their new pups for their first true dog-dog introduction. Everyone’s training and laid back but attentive attitude led to a great meeting that will help the dogs re-connect when we see each other again next month. The leg work for the run included obtaining permission from the event host and a couple practice jogs. No doubt, Ty can run three miles, but in sync with me in that sort of environment, we did some mock exercises to mentally prepare. We haven’t done much with the canicross; I’ve been waiting for our foster dog Jessie for that but I have been fitting Ty with the Hurtta harness Backcountry K9 sent us for testing and Ruffwear’s Slackline leash which was perfect for the race, allowing her more or less room depending on the crowd’s density while I remain hands-free. I held her for the opening speech and horn, knowing that would frighten her but once her paws hit the ground, we were off and she was a superstar. 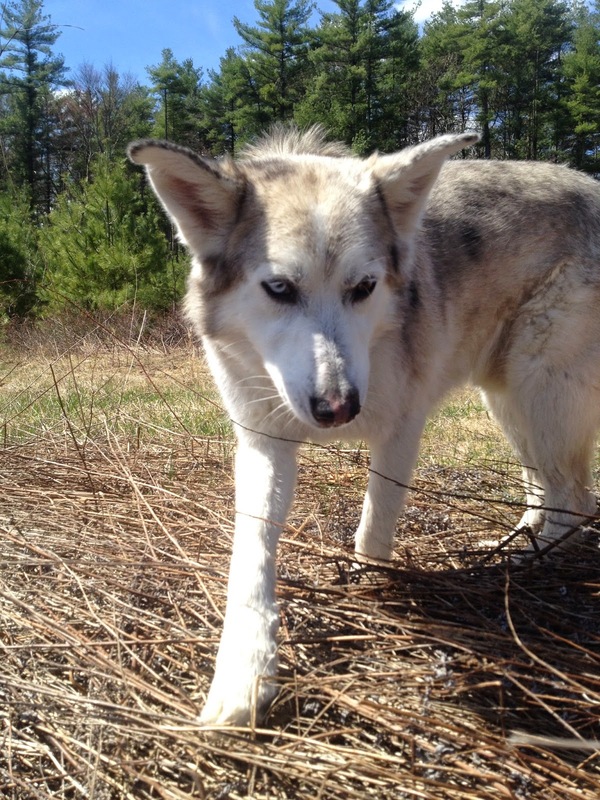 We moved seamlessly, taking turns, maneuvering around participants, and passing other dogs with confident grace. As a condition of Ty’s participation, we were asked to keep to the side of the road and I tried encouraging her to run on the dirt for less of an impact on her joints but she really wanted to be between me and my stepmom. Or just next to Linda and I’m giving myself too much credit. Anyhow, we shared some pizza to celebrate before moving forward with the day (which was also stellar but more fitting for a journal entry that I spare the folks kind enough to read ;) ). Goddard is a massive park that caters to multiple hobbies. Fields accommodate sports and picnicking, multi-use wooded trails for horseback riding and walking, a boat launch, beach access, a golf course next door and a good deal more. 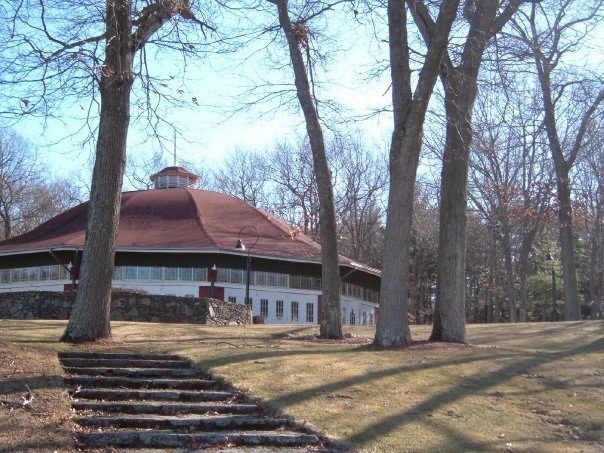 There are also many pavillions and the carousel house set up for events from family functions to car shows. Seriously, it's massive! 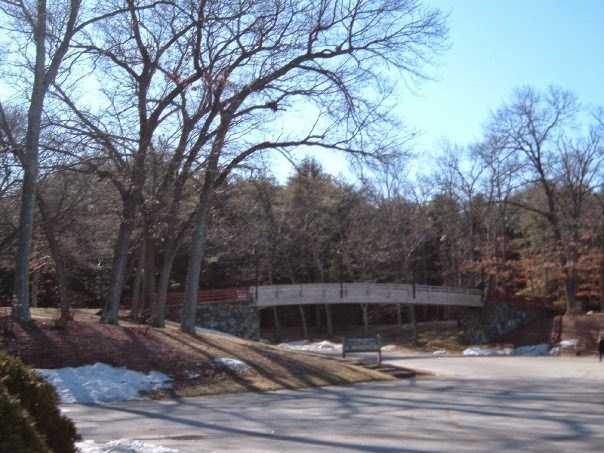 Local Trails at Orr's Pond, 1296 Route 123, Attleboro, MA. Less than five minutes off of Rt 95 in Attleboro, MA (between Boston and Providence). Nothing official about this place, just an easy walk in the woods. One thing I am always doing while on the road is watching for parking areas with no obvious destination, trailhead signs, and clusters of rugged-looking vehicles. I spent decades watching cars park in a small pine needle covered space to the side of one of the town’s wastewater treatment facility’s properties, evidently to fish, among other things. While Ty and I had our fun at the race, I had left Tango with my husband and his family, knowing he hates jogging, would have suffered in the heat, and gets spoiled by them with food and lovins. I’m not generally the type to separate our pack but this was definitely a win-win. After we reunited and the temperature cooled, more exercise was in order. We needed a fun walk with a short commute so we drove over, fingers and paws crossed. It is a nice, quiet walk with lots of options but stays close to the road. Despite it being completely unofficial, many of the trails are broad and there are quite a few, well-worn footpaths. Beware of trash and critters but the kids fishing were friendly. I can’t pretend to know any of the rules aside from my assumption that the town’s leash law is in effect and the abide by the rules signs at other water department facilities that include “no fires, no littering, no swimming, etc.,” pretty much none of which appear to be observed unfortunately…. Love this place! Another property that, based on a quick Google Maps search, had been on the radar for a bit. It is a beautiful, interesting place – working hayfields, farming/local history, and young pine and deciduous forests that let the light shine through. The trail system is impressive and allows for endless possibilities; we easily spent over an hour. 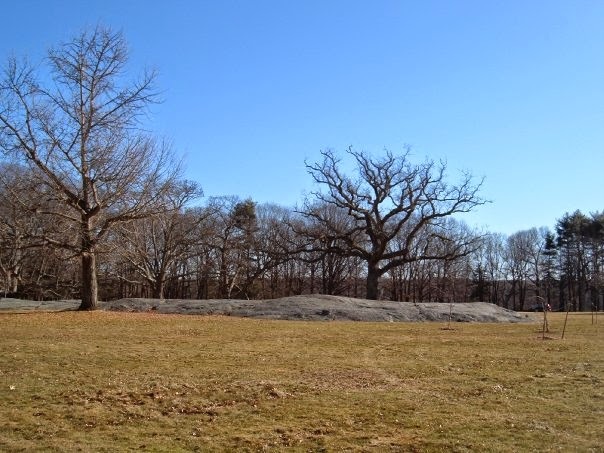 The primary trails are broad but some have become trenches allowing for seasonal vernal pools (that will become very buggy before soaking into the earth). Side paths are abundant. The trails are not always marked, fair warning on that one! There was one lovely stream crossing on the White Trail that was crystal clear and perfect for the dogs to wade in. A notice was posted by the entrance advising visitors to leash dogs during hunting season so I assume the default rule is that voice command is acceptable. All in all a wonderful, busy weekend with happy pups and family. Also added a couple places to the list to re-explore in depth so check back with us over the summer! 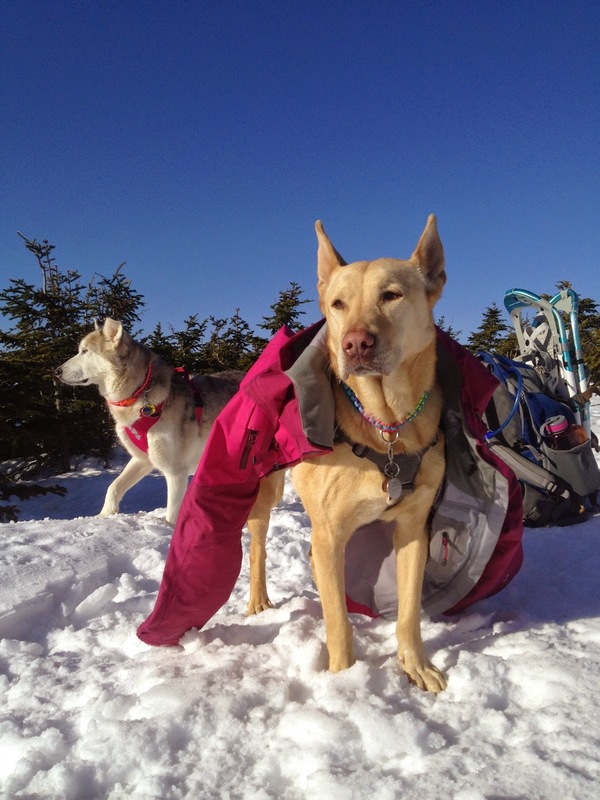 Traveling with the pups adds extra steps and gear (foldable bowls and travel beds are great!) to the equation but it’s all second nature now. Evaluating when they can stay in the car safely and comfortably, getting them out on walks, hopefully tying that in to a visit with outdoorsy family members, and trying to keep the burden on family minimal is a logistical game but I wouldn't have it any other way and am grateful for flexible family! Today’s hike was my reward for completing our taxes and it also felt pretty cool we stood within sight of the location of the highest winds recorded on Earth 81 years to the day of the recording. 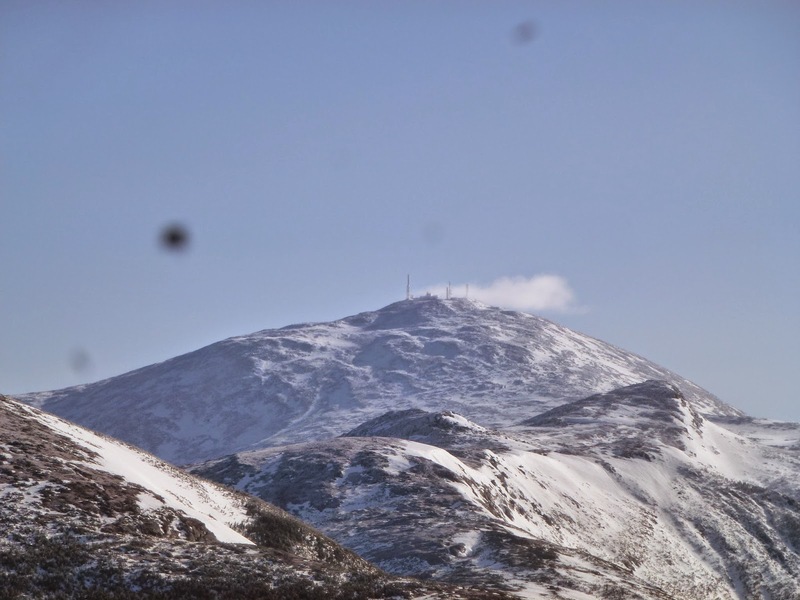 Watching the snow whip around and over the buildings on Mount Washington it is clear: it is a formidable peak any day. Mountain mojo was really with us, as we had excellent trail conditions, stellar weather, and the dogs showed off their manners as we met many friendly hikers on the descent. Finding the Webster Cliff Trail can be a little tricky; once one takes the right at the junction, it ascends over rock (ice) almost immediately to the right. I had to scan the area at first but it becomes apparent quickly that the rocks are arranged in such a way to herd hikers in the right direction and soon enough we found cairns. We were socked in the first time we reached Pierce, (which we bagged with Jackson for the Four Thousand Footers List), so it was awesome to return and see the view that is nothing short of extraordinary. After our summit routine, we heading back the way we came. The trail is so well packed, graded, and broad, I was tempted to join Ty in jogging down. 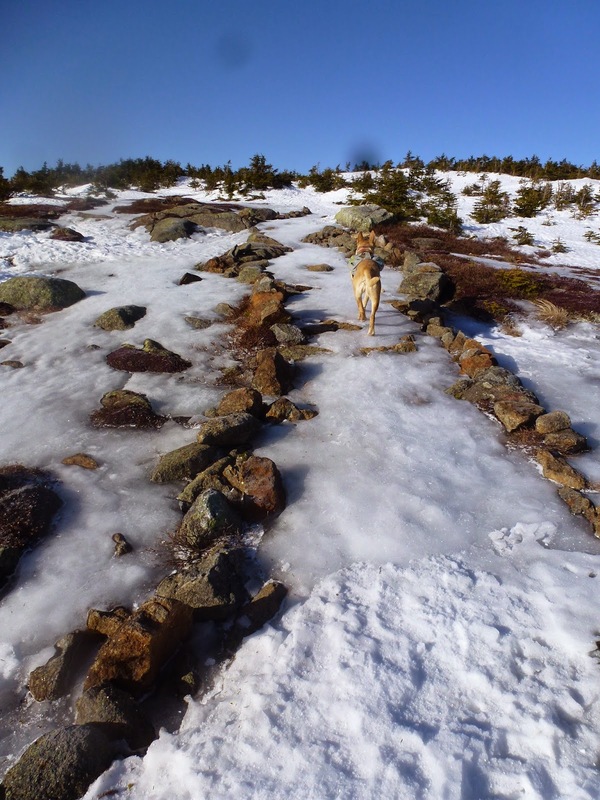 (another argument for winter hiking – no rocks to trip on!). Tango was definitely off though, so I only did in spurts on occasion then waited for him. I’ll be watching him carefully over the next few days and hikes. He was not showing signs of physical pain, nor did he pant much til we were within earshot of the highway (when the temps really started to behave spring-like), but he was mysteriously sluggish. Other than that, I let him pick our pace and Ty did her usual scout ahead, look back and wait for my signal, repeat. It really is a nice walk down as well. I cannot speak highly enough of this hike. It is everything others have described it as – a great intro to winter 4K footer hiking, the Presi’s, above-treeline exposure, etc. I’d call it one of the best “bang for the buck” hikes in the Whites, at least in winter when we’re taller than the scrubby summit trees! As for its relevance to paws on peaks, we also deem it “dog friendly” for the reasons listed above and the happy pups we met while we were out! 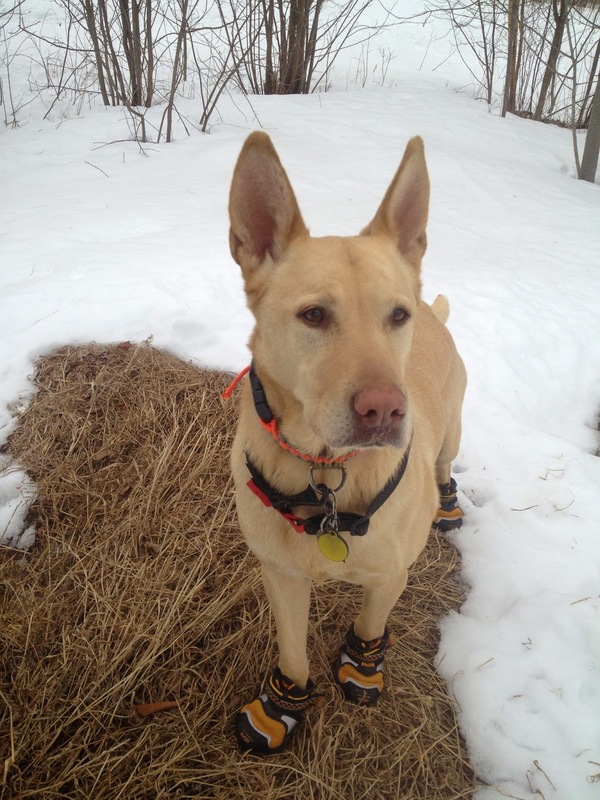 For all the gear we have, I have only ever used boots when Ty wrecked her paws, believing the natural instincts of bare paws on the ground are unmatched. I feel most balanced and confident in minimalist footwear myself. This winter helped me see another point of view; the temps were so cold, I started trying footwear for Ty so that we could go for walks and hikes at all. 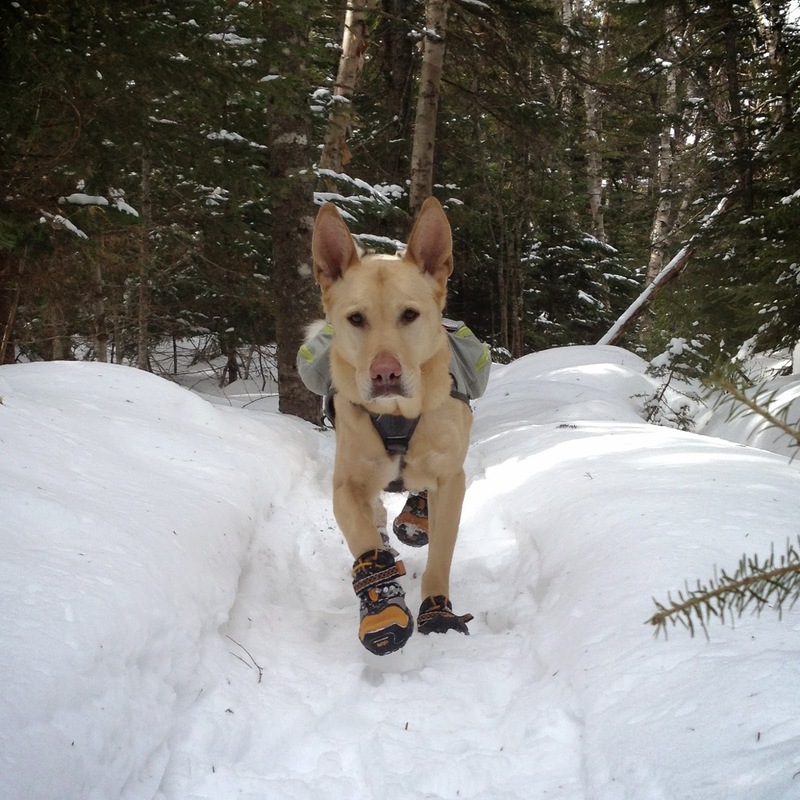 Thankfully Backcountry K-9 stepped in with a set of Kurgo’s Step ‘n Strobe boots to test out. It was regularly in the single digits this winter and Ty was doing the back leg hippity-hop on our walks around the neighborhood. 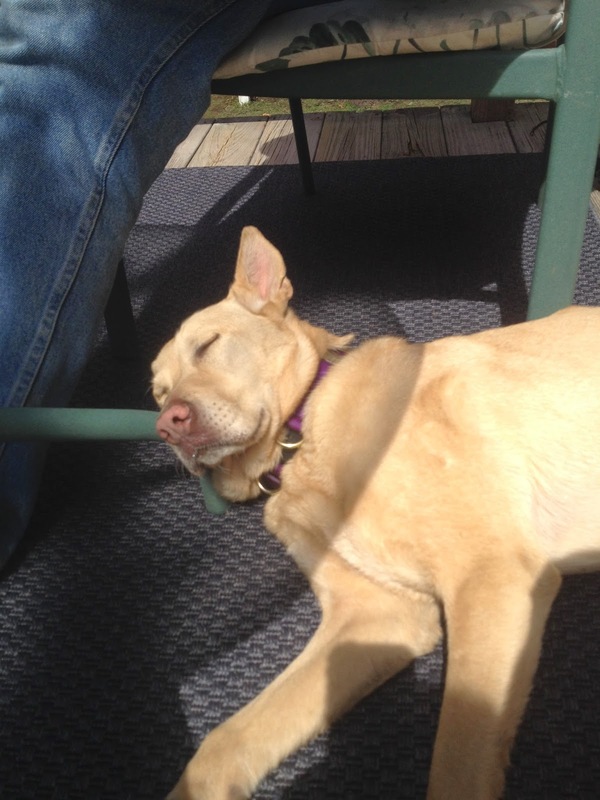 That’s when I started jogging and taking less/shorter breaks on hikes, all to keep her body temp up and feet moving. 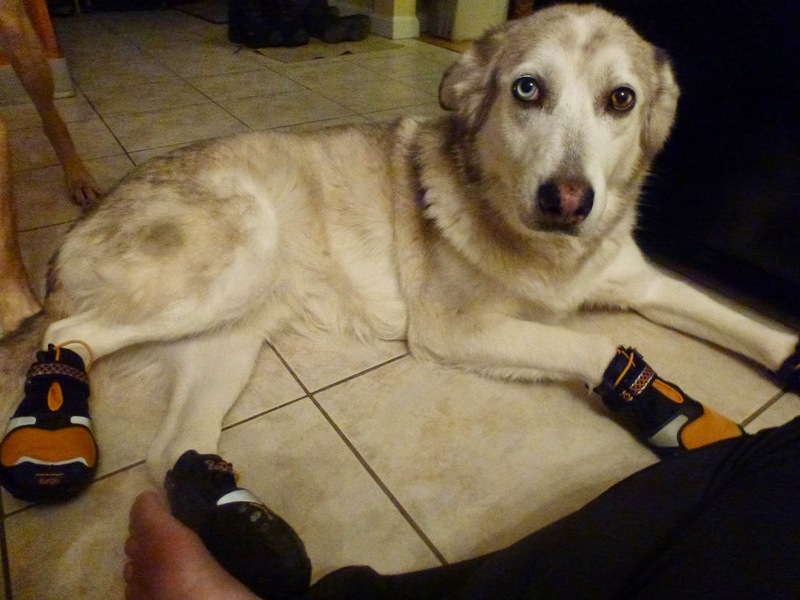 They still weren't ideal solutions so I considered sled dog booties. I have no idea how folks have such success with them. Just before placing an order, I had a flashback to using them years ago and them wearing out or getting soggy quickly. Then I tried PawZ with synthetic blend socks underneath and those did alright. They’re a decent solution for winter/snow - $20 for a pack of 12, stay on relatively well, and are waterproof, but no adjustment for tightening/loosing and trap all the moisture from the dogs’ paws as they sweat. I know several folks for whom this setup works well for winter hiking. Shortly after trying those, our Step 'n Strobe boots arrived! The first week was trial week. Turns out, despite my best efforts, I didn’t size the pups well. Sizing is essential for the boots' effectiveness and dogs’ comfort. They will pop off if too big or too small and it is important to remember that a dog’s paw expands as s/he pushes against the ground. Tango high stepped his way out of having to test them but he was the least affected anyhow so I spared him and focused my attention on Ty. On leash or in the house, she is perfectly pitiful, freezing or moving with sloth-like "grace." 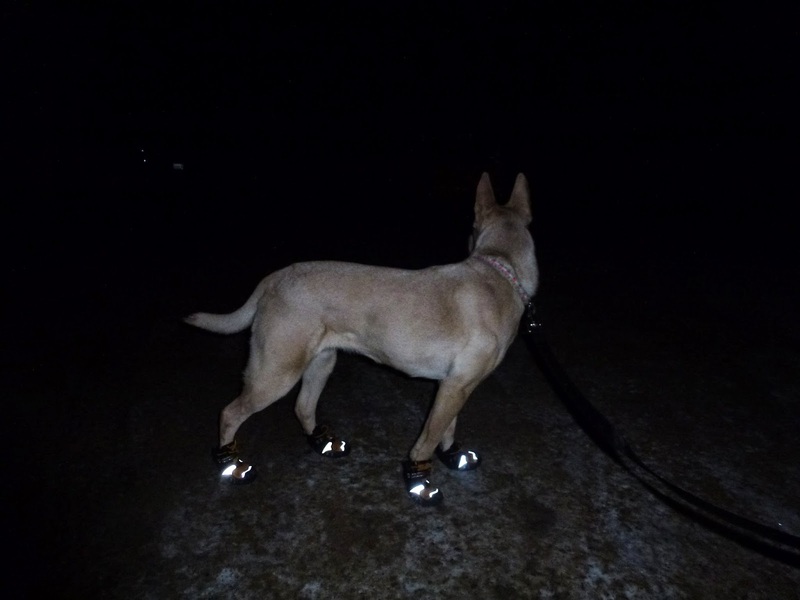 Over time, she began to accept them on leashed jogs but I/ we really got to test them when she was set loose on the trail. The boots’ design, neat features, and winter & low light applications make me a boot-believer. Unlike any other boot we’ve tried, these stayed on, so serious kudos for that! The boot’s sole is round but the upper tapers to go a little further up the leg than Ruffwear’s Grip Trex model (which we've had in our first aid kit for years and Ty has done four thousand footers in). It has one Velcro strap supplemented by a cinching cord. The tread is respectable but a little slick and the rubber is solid. The boot in general is durable. The only thing I question is the longevity of the cord. The other highlight of these is the LED lights that are triggered when the boot hits the ground. So cool! The neighborhood we walk is depressingly tiny and some residents treat it as their own giant driveway, putting me on edge often. I absolutely love the lights and reflective material. The down side to the lights is that are expected to last for approximately 18 months of regular use and the batteries cannot be replaced. There is no on/off switch for daytime use either. So low and behold, there is a place for boots outside of the emergency kit! For us, it’s winter.